I haven't shared much about my health/weight loss journey and how I found a Paleo diet. It was a long road to where I am now, but the Paleo part started for me about 5 years ago when I met Dathan. He showed me by example that you could be healthy, strong, and thriving on a super simple diet free of dairy and grains. I jumped on board the Paleo train, thinking maybe it would be a "fad" for me... and here I am 5 years later, still going strong! Over the years, I've come up with so many Paleo-fied recipes to replace the comfort food favorites I once splurged on. But one realm I haven't quite conquered is the party food snack table... because I'll still 100% go to town on some chips & salsa if they're sitting in front of me at a gathering. I have found, however, that one way to trick myself into skipping the chips (or at least cutting back) is by filling up on other tasty snacks that have more "meat" to them... pun intended. One of my favorite party foods to date has been my Chicken Fajita Poppers which give me spicy chicken nugget vibes and taste sort of like junk food but are totally simple & good for you. Dipped in salsa, guac, or dairy-free ranch? Easy. Let's just say I'll be requested to make these at all future gatherings! Our pickiest family members all enjoyed, and even our 5-year-old nephew was eating these by the plateful. Talk about the best feeling~ making something I know is super clean, yet everyone loves it & has no idea how healthy it really is! 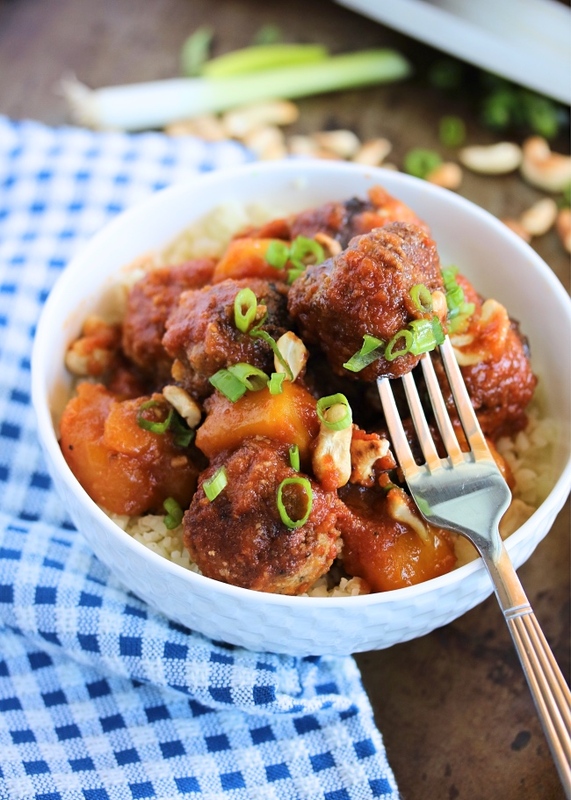 While it's great ingredient-control practice to make your own meatballs, you can totally short cut this recipe by subbing pre-cooked packaged ones that you like. Our favorites are the Teriyaki Pineapple from Aidell's. Just go straight to making your sauce & slow cook till done. And while these are perfectly served straight from the slow cooker with toothpicks, they also make an easy-peasy meal. 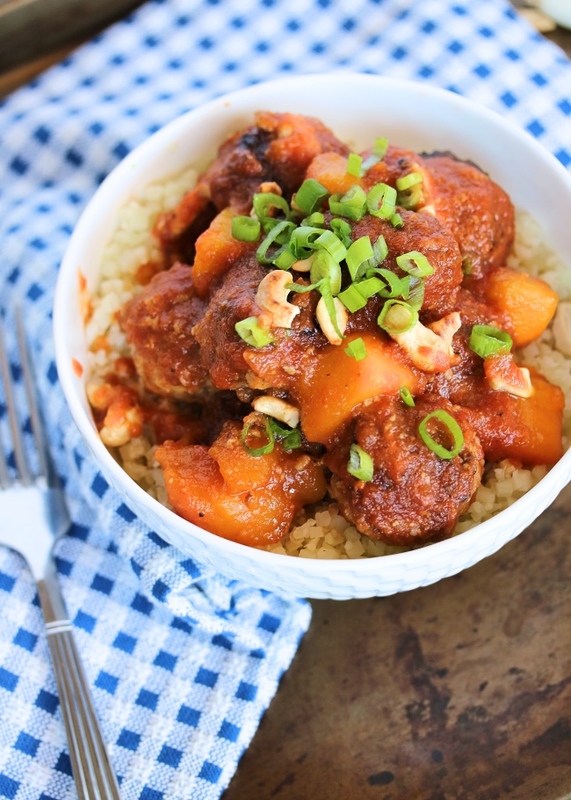 See my notes below for our favorite way to turn these into a full dinner: Asian BBQ Meatballs Bowls! Add the meatball ingredients (except the oil) to a large bowl, mixing well until combined. Use your hands to roll the meat mixture into 25 to 30 2" meatballs. Heat the oil in a large skillet over medium-high heat. Add the meatballs in a single layer, with a little space between each. (I cooked mine in two batches.) Pan-fry the meatballs on medium high for 2 to 3 minutes per side to brown, cooking to about medium doneness. 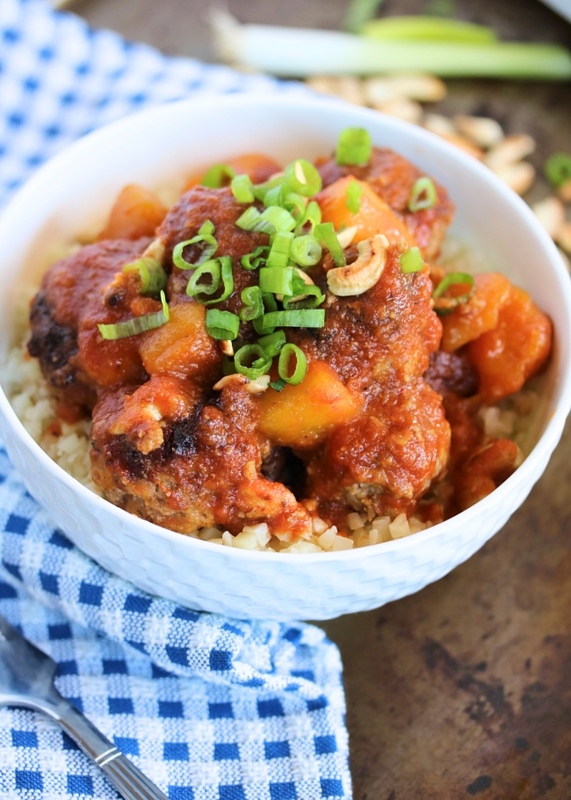 Transfer the meatballs directly to the bottom of a slow cooker. Make your BBQ sauce by adding the sauce ingredients to a blender and pulsing until smooth. Add chili flakes & salt, to taste. Pour the sauce over the meatballs. Cover and cook on low for 3 to 4 hours, or high for 2 hours. You can set the slow cooker to stay on the "warm" setting while waiting to serve. Add 1 to 2 cups of pineapple or mango chunks to the slow cooker along with the meatballs before cooking. 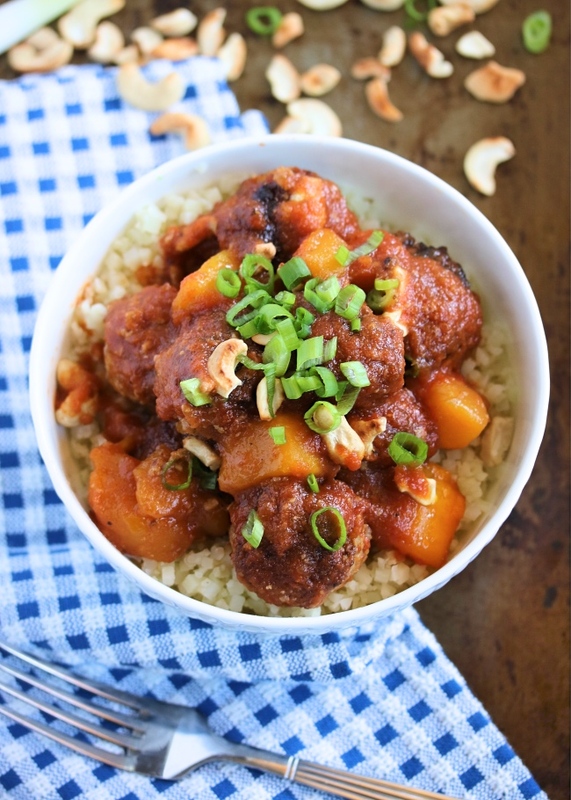 When the meatballs & fruit are finished, scoop over steamed cauliflower rice to serve. Top with toasted cashews & sliced green onions. If you are making these on a Whole30, be sure to skip the sweeteners (coconut sugar & maple syrup). They add to the Asian flavor profile, but are totally skip-able! Feel free to use frozen fruit (I do!) Just be sure to heat it for a few seconds before blending into your sauce. With bistroMD you know that you will not only eat gourmet meals, but that every entree and each in bistroMD's weight loss program is balanced to bistroMD's custom nutritional platform to help promote an healthy diet. STEP 2 - See your menu in advance and choose the entrees you want for each day and week. STEP 3 - Order your weight loss program. Made this tonight. Big hit, even with my picky kids. Thanks for the recipe! If you dont have a slow cooker, is it possible to make this on the stove top?